The Fayetteville Branch of the International Association of Administrative Professionals (IAAP) will host a half-day conference in celebration of Administrative Professionals Week on Tuesday, April 23. 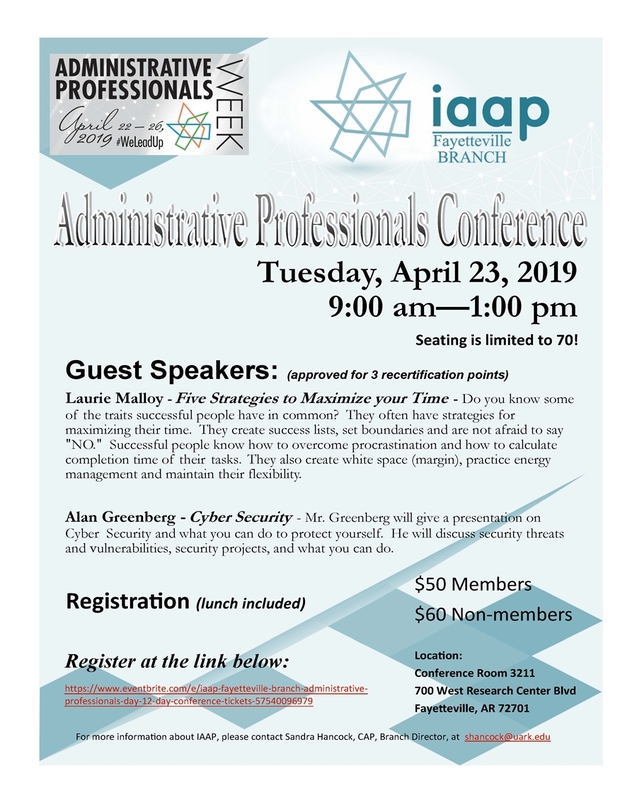 This year the conference will feature Alan Greenberg addressing Cyber Security and what you can do to protect yourself, and Laruie Malloy presenting on "Five Strategies to Maximize Your Time." The conference will begin at 9 a.m. and will run through 1 p.m. with lunch provided. It will take place in Conference Room 3211 at 700 W. Research Blvd. in Fayetteville. Registration costs $50 for IAAP members and $60 for non-members, and the deadline for registration is Friday, April 19. Seating is limited, so please act quickly. Don't miss this opportunity to hear two wonderful presentations, network, meet new people, and develop both professionally and personally through this fun and engaging event. Please click here to register for the event. If you have any additional questions or comments, or if you would like more information about the Fayetteville LAN of IAAP, please contact Sandra Hancock at shancock@uark.edu.